Comedian Mark Lowry has twice found success by recording a collection of relatively serious songs. Be The Miracle follows in the footsteps of But Seriously (1998) and Some Things Never Change (2003) in that there’s no spoken comedy, just singing. Be The Miracle begins with the mid-tempo anthemic title track. (The feel of the intro with an accordian in the mix made me think of “Two Sets Of Jones” by Big Tent Revival.) Songwriters James Thiele and Jeff Silvey have crafted a lyric that could be a strong candidate for a mission organization’s theme song. “What Kind Of King Is This” is next with a light pop music feel. Lowry is joined by Susan Ashton for a duet on the lushly orchestrated “I’ve Never Been Out Of His Care,” a Phil Johnson song originally recorded by Dallas Holm on the now classic I Saw The Lord (1981). “Carry Me” is another cover tune, written by Sonya Isaacs and recorded by her family group on the CD by the same name in 1994. Michael English and Kim Lord join Lowry on the choruses of this song to create a trio arrangement. Be The Miracle shifts gears to a more upbeat mood for the next three tracks. “Jump Across Jordon” is a Southern Gospel male quartet arrangement with some nice horn licks thrown in for good measure. The horns continue for the next track as well, yet another self referential ode to Lowry’s hyperactivity, but with the focus this time being “God Is Crazy About You.” It builds into a double time frenzy before concluding with a few more horn blasts. “The Sweetest Song I Know” is the Albert E. Brumley classic tune with a modern arrangement. Four songs remain. “Give It Time” is a Woody Wright lyric with a fun, Country rhythm. “God Calls Us All” and “Whatcha Need” also have vocals that feel lighthearted, though neither is outright comedic. “Uplifting” is a more appropriate adjective. 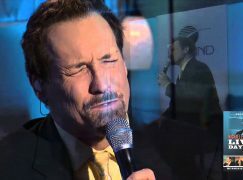 Be The Miracle concludes with the Gaither classic “Going Home,” with Kim Lord and Michael English again joining Lowry. Mark Lowry knows how to put together a good CD. Every lyric has plenty of “heart,” and the production quality on Be The Miracle is excellent. Be The Miracle is being distributed by New Day Christian Distributors.